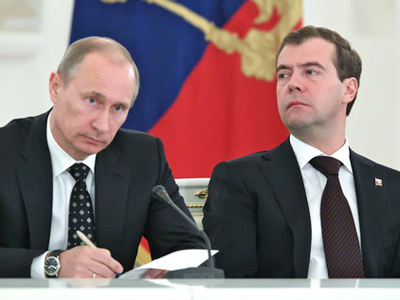 ­A final decision will be taken by the Moscow City Court. However, prosecutors suspended the operations of the nationalist inter-regional public organization after reviewing it for compliance with national legislation. The movement’s objectives and actions are aimed “at carrying out extremist activities,” the Moscow Prosecutor’s Office said. It had already sent a petition to the Moscow City Court, qualifying the movement as “an extremist organization.” The leadership of the movement was informed of the decision on Wednesday. DPNI activists have warned the decision may “radicalize youth nationwide and lead to mass protests.” Masked young men “controlled by absolutely nobody and nothing” will not be warning the authorities and take to the streets, former DPNI leader Aleksandr Belov told Interfax. The ban on nationalist organizations will lead “to a host of radical cell groups,” he added. 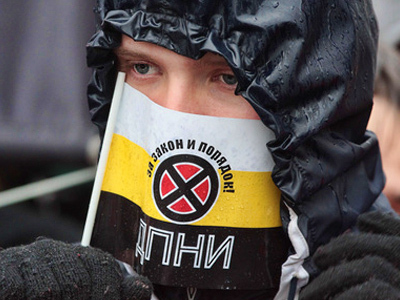 The nationalist organization was banned following a recent flare-up in nationalists’ activities in the wake of the turmoil on Moscow’s Manezh Square late last year. 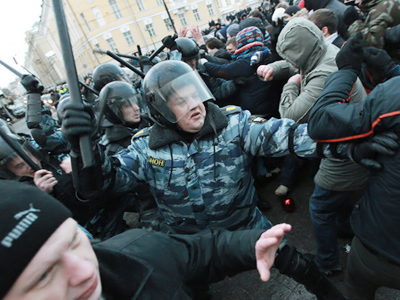 Thousands of football fans clashed with police in the center of Moscow, shouting nationalist slogans after their comrade had been killed in a street fight with a group of men from the North Caucasus. Prosecutors did not specify DPNI’s violations. Earlier, another nationalist organization, Slavic Union, had been banned for “unknown reasons” as well, DPNI leader Vladimir Yermolaev told Kommersant daily. Last year, the union was suspended by the Moscow City Court, but their leaders renamed the organization to “Slavic Force” and continued their activities. DPNI was founded in 2002 as a protest against illegal immigration from the former Soviet republics to Russia, but has never been officially registered since then. The movement has organized widely-publicized “Russian marches” on November 4 attracting more than 5,000 participants each year. 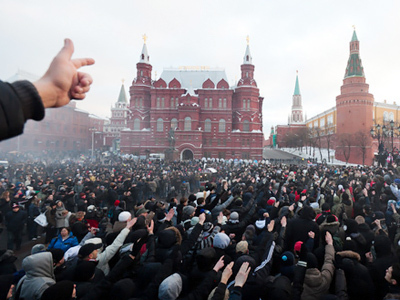 The DPNI leaders tried to lead the fracas on Manezhnaya Square, but they were “turned down by the crowd,” the paper said. 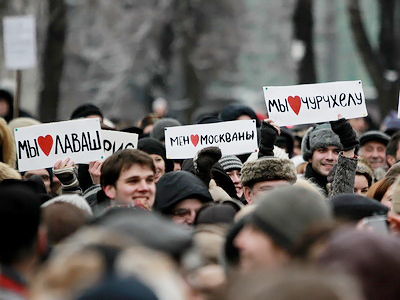 Support for a nationalist rally on Manezhnaya is the main reason behind the ban, Yermolaev believes. There are organizations more extremist than DPNI, said Aleksandr Verkhovsky, head of the SOVA human rights center. But he added DPNI was openly trying to ride the wave of rage raised on Manezhnaya Square, although it did not organize the riots.